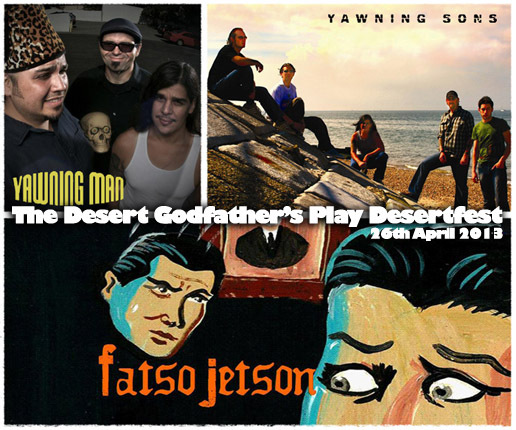 "YAWNING SONS" would like to thanks all those who attended DesertFest 2013 to witness them perform with "FATSO JETSON & YAWNING MAN" as the "GODFATHER'S' OF THE DESERT" on the Friday 26 April. The amazing opening night to DesertFest set the tone for the entire festival. To celebrate legendary "GODFATHER'S' OF THE DESERT" show a silkscreen poster on Ivory 180gsm card was printed limited to only 50 copies. The first 45 were sold at or immediately before the festival but the final remaining five copies are now available through the "Sons of Alpha Centauri" shop. We have also released a new t-shirt designed by Seldon Hunt and silkscreened by Bourne Creative. This T-shirt is limited edition and includes custom backprint, sewn S.O.A.C. tags on charcoal grey American Apparel and is also available from the shop.